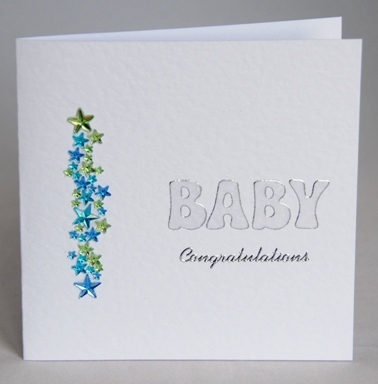 This card, to welcome a new baby into this world, has a cluster of blue and green stars down the left hand side. Clear letters, outlined in silver, spell out the word baby and underneath these is the word congratulations also in silver. The card is blank inside for your own words of welcome. It is also available in pink. Please let me know which one you would like at the checkout. If ordering by phone, please reference card #531.